On Arthur Conan Doyle's birthday Chris Gehrz at The Anxious Bench writes about "The Religious History of Sherlock Holmes." Doyle himself was a Spiritualist and certainly unorthodox in his religious opinions. ﻿﻿Of course, the coldly logical Holmes would seem like a natural skeptic of the “psychical knowledge” for which his creator evangelized. The Scarlet Claw, the best of the World War II-era films made by Universal, finds Holmes and Watson attending a meeting of an occult society in Canada. “If the facts are there,” insists a Conan Doyle-like aristocrat, “even the most hardened skeptic — provided he has an open mind — must finally acknowledge the actual existence of the supernatural.” “Facts are always convincing,” responds Basil Rathbone’s Holmes. “It’s the conclusions drawn from facts that are frequently in error.” …. 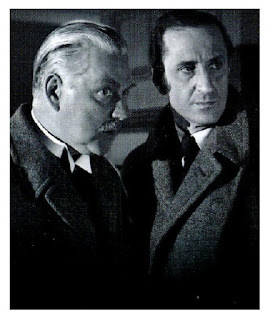 The Universal pictures starring Basil Rathbone and Nigel Bruce remain my favorite Sherlock Holmes films. I even enjoy the updating to World War II. My enjoyment is undoubtedly partly nostalgia — I may have first seen them on television Sunday afternoons watching from my great-aunt's couch before we had a TV at home. The Scarlet Claw is one of the most atmospheric and a favorite, although not particularly related to any of Doyle's stories. I may watch it tonight in honor of the creator of the characters.